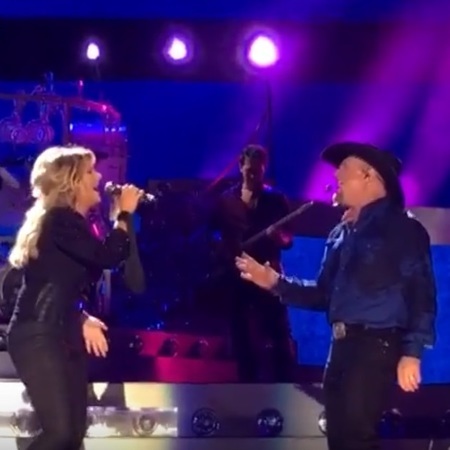 This Is Garth and Trisha: the Tribute to Garth Brooks and Trisha Yearwood! 2019 The Lowell Elks Lodge will host a musical tribute to the reigning king and queen of country, Garth Brooks and Trisha Yearwood, featuring an authentic re-creation of their most recent tour. “This Is Garth: The Original Tribute to Garth Brooks and Trisha Yearwood” features an 8-piece country band performing Garth’s and Trisha’s greatest hits. The song list includes: “Calling Baton Rouge”, “Shameless”, “She’s In Love With The Boy”, “Whiskey To Wine”, “Friends In Low Places”, “The Dance” and the most recent song that Garth performed at the 2018 Country Music Awards “Stronger Than Me”. The band features J. Hunter Laite as Garth Brooks, Ashley Hewitt as Trisha Yearwood, accompanied by renowned country musicians including Bill Norton on keyboards and vocals, Joe Kessler on fiddle, Eric Royer on pedal steel, John Repucci on drums, Tom Yates on guitar and vocals and Rick Hilton on bass and vocals. This all-age event will raise funds for the Greater Lowell Boys and Girls Club (15 percent of the admission proceeds will be donated to the Boys and Girls Club of Greater Lowell). Based on Garth’s song “We Shall Be Free”, the theme of the show will focus on inclusion and acceptance. The doors open at 7 PM, the show starts at 8:15 PM. A cash bar is available. Tickets are USD 20. in advance and USD 25. on the day of the event (processing fees may apply). Tickets are available at The Lowell Elks Lodge, 40 Old Ferry Rd., Lowell MA, Sully’s Tuxedos, 90 Bridge St., Lowell MA, and Lenzi Catering / The Tavern @ Lenzi’s, 810 Merrimack Ave., Rt. 110, Dracut MA. To purchase tickets online or for more information visit the website www.ThisIsGarth.Live .